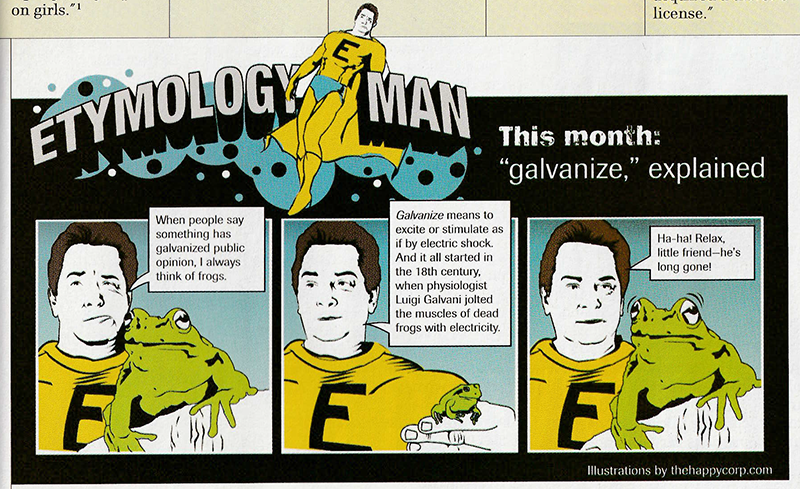 Etymology Man is a character that I created* during my editorship of the late, great GIANT magazine, circa 2004, for a comic strip of the same name. The idea was that Mr. Man would swoop in to explain the origins of certain words, and... Well, that's it. Sometimes he would swoop back out. Not always. Though he appeared just five times, Etymology Man made an indelible mark. Because he was drawn with indelible ink. I miss him. Here are all five installments, in order of appearance. * As noted in the strips themselves, artwork is by TheHappyCorp.com, which apparently is now defunct. I never knew who, exactly, drew the things—our art department handled that stuff—but I was always happy with the results.